Simply put, there is no album in U2’s catalog that divides fans quite as much as Pop, the band’s final album of the 20th century, and one of the weariest, most desperate farewells to the past century as was ever recorded. And it’s not really hard to hear why: This is the album where U2 pushes everything to the absolute limit, sprawling and complicated and piled high with excess and noise. If they flirted with electronic music on Achtung Baby and subverted pop formula on Zooropa, this is the album where they dove head-on into everything that’s trashy and vulgar and empty about pop music, and indeed, all of pop culture. But for all the album’s bleakness and its unflinching look at greed and decadence, it’s not an album without hope. “Gone,” with its furious, buzzing guitars, is as exhilarating as just about any of the band’s 80s anthems, and it finds Bono wearily, resignedly looking beyond the desperation of this world to the joy that awaits in the next. The album’s final song, “Wake Up Dead Man,” is Bono’s strongly-worded plea to the Divine, a Psalm-like lament of this world’s waywardness and an impassioned prayer for God to make things right. Some Christian listeners have misguidedly written off the song as a declaration of Bono’s lost faith, but in fact it burns with the kind of honesty and compassion that reveal a strong, vibrant, wrestling faith, not at all unlike the writings of David or the prayers of Job. Of course, their next album would begin with the soaring euphoria of “Beautiful Day,” a resounding answer to the desperation of “Wake Up Dead Man,” a joyful celebration of the reigning Lord of this world and the next. But Pop remains a powerful and affecting testament to the struggle to keep faith in a dark age, a sad but determined album of spiritual inquiry and intimacy. 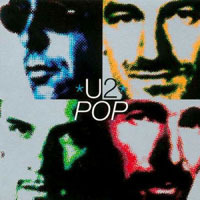 As such, it stands out not just as U2’s boldest experiment, but also one of their most arresting and moving works.